BsnTech was contacted by Jack a couple months ago, the owner of Nifty Thrifty Five. He originally contacted us to make him a website where he could sell items through fixed prices and also through auctions. Work on his website continues, but we have finished his logo design. We appreciate the business from Jack and look forward to having his website done in the near future! Laura contacted BsnTech Networks a couple of weeks back asking about website design. She had a website created in the past, but was not happy with it. We worked with Laura to explain how we create websites. We also gathered the requirements that she had for the site. She wanted a very simplistic, easy-to-navigate website with two slideshows to showcase some of her paintings and word works. 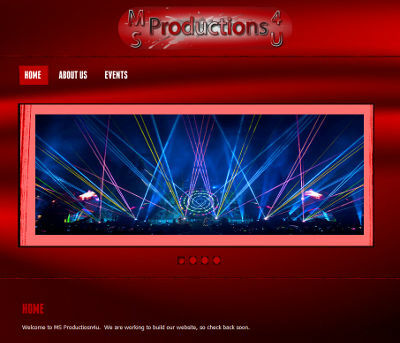 Laura then got back in touch with us last week to move forward and start on the site. In less than a week, we had her new website up and running. She was very pleased with the quality of the work we did, the open communication and fast responses, and the fact that her website turned out exactly as she wanted it. Laura’s website is at lauraepler.com. John contacted us last week in regards to creating a website for his new business, Get Paid Picks. He provides picks for sporting events for those that make bets on them. 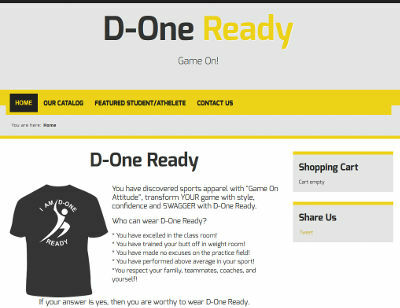 After getting the list of requirements from John, we got started right away on the site. 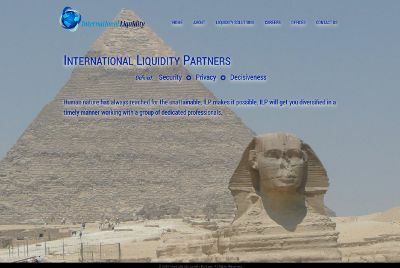 Within just a few days, his membership-based subscription website was completed. We did have to wait a little over a week for our graphic designer to provide a background image design and a logo design for John, but it was completed as quickly as possible. Today, John just launched his website and has began advertising his picking service. We appreciate his business and hope we met his expectations! 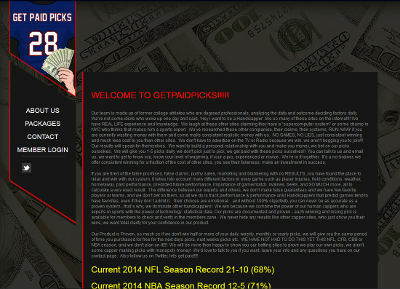 The Get Paid Picks website is at getpaidpicks.com. 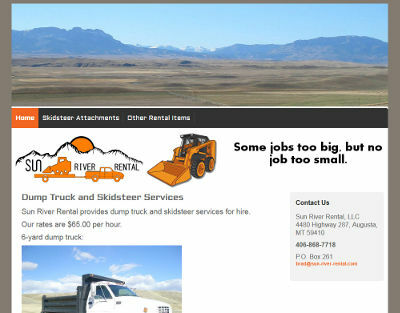 Brad, the owner of Sun River Rental in Augusta, MT, contacted us earlier this week asking about website design. Right away, he let us know that he was very impressed with the level of information that we provided on our website and our video tutorials that allowed customers to manage and update their own websites. 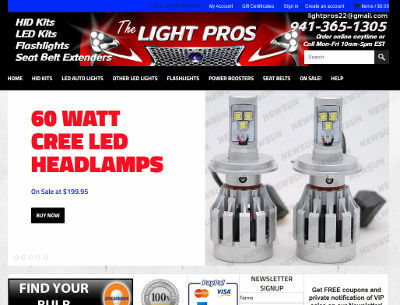 For this reason, he said that our business was ‘very well organized’ and had ‘great pricing’ and so he placed his order with us right away for a simple website. Brad then sent us the information the next day. We started on the site and had it ready for his viewing within 48 hours. 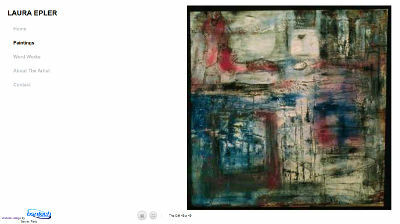 After a few changes, we have now launched his website and it is active! We appreciate the business from Brad and hope we met all of his expectations with serving him for his website service needs. The Sun River Rental website is at sun-river-rental.com. Chuck, the owner of Be Yoga Decatur, contacted BsnTech a few months back in regards to having a website designed for him. His website has been online for quite some time, but he has been sending us information over a long period for his website. 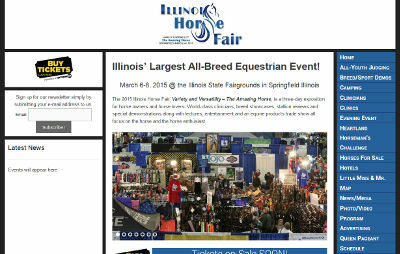 Today, we made the decision to go ahead and let our customers and potential customers know that we have made the website. Chuck will be one of our customers that will need website maintenance work done to his site on an ongoing basis due to the nature of his business. 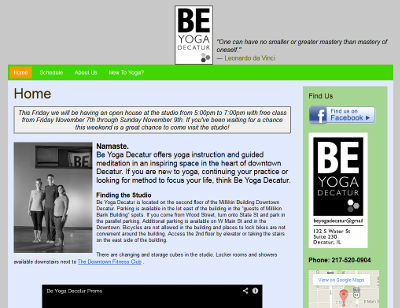 The Be Yoga Decatur website is at beyogadecatur.com.